Shaun Higgins and Taylor Adams say Brendon Goddard’s comments about Ben Brown were “harsh”. 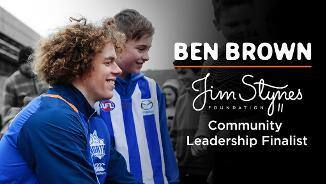 Few players have had shown more determination in reaching 100 games than North star Ben Brown. Overlooked for three drafts before making his way to an AFL club, Ben Brown represented Tasmania in the 2010 Under 18 National Championships. However he tore his anterior cruciate ligament which resulted in the key position player being overlooked. The following year was again restricted by groin injuries, and Brown returned to Glenorchy for 2012. A promising season in the TSL got Brown back on the radar, and he moved to Melbourne in 2013 to play for Werribee in the VFL. Part of a Tigers’ outfit which made the preliminary final, Brown kicked 29 goals in 18 games and also spent time in the ruck. 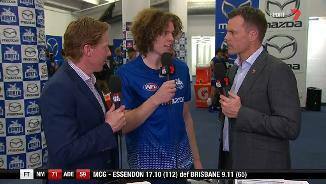 It caught the eye of a few clubs, and North Melbourne selected him with pick 47 in the National Draft. Another year, another impressive season for key forward Ben Brown, who came agonisingly close to claiming his maiden Coleman Medal. Kicking 61 goals for the season, Brown played all 22 games, and was North’s go-to target all year. Renowned for his strong overhead marking ability, Brown also impressed onlookers by his workrate around the ground and willingness to bring the ball to ground when out of position. 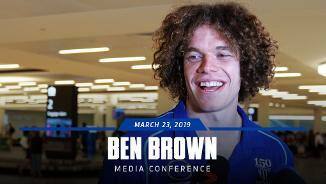 When Mason Wood and Jarrad Waite were both sidelined through injury, Brown was often confronted with many outnumbered contests, as opposition defenders looked to make life hard for the 25-year-old. 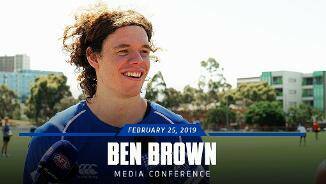 In the 2017 season, Ben Brown was undoubtedly North Melbourne’s brightest star. In a year where the club often found itself on the wrong side of results, and at the wrong end of the table, Brown was among the competition’s leading goal-kickers. He ultimately finished third in the Coleman Medal at the end of the regular season, with 63 goals. His strong hands and deadly accurate kicking have made Brown one of the competitions elite key-forwards, with the big man destructive on his day, as emphasised by his four five goal hauls for 2017. “He had a good year, and it was still another learning year for Browny because he got the best defender quite a few times. “You would think next year with a few of the departures that he might get the best backman again. “His pre-season will be based around getting stronger and quicker while working on his one-on-one work because he’ll be playing on the better players again. “His preparation is fantastic. Everyone can picture exactly how he has a shot for goal because his routine is the same every time. “He does everything right and gives himself every chance to play well every week. We need him to go to another level because 41 goals isn’t easy and we need him to do that and more. 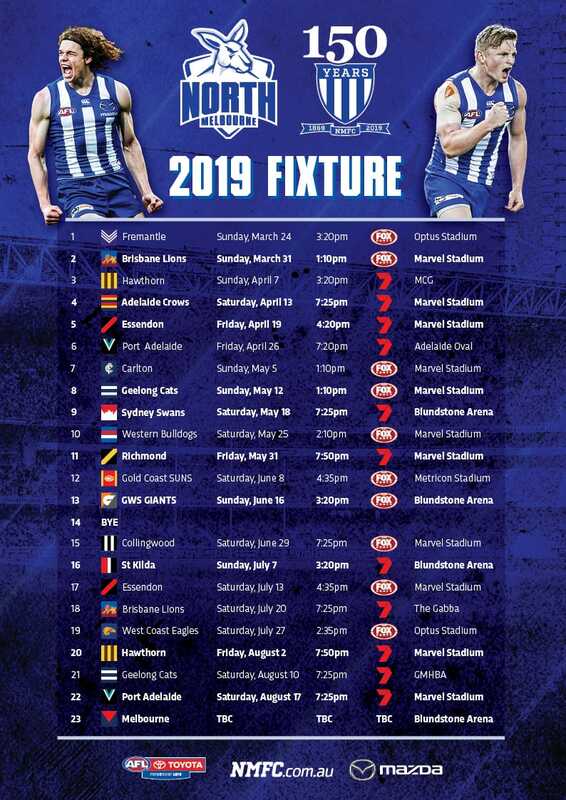 "'Browny' has been a touch inconsistent, but in terms of his eventual output he's still getting more than a goal a week. "He's had a couple of good games and he's had a couple of quieter games. He's been subbed a couple of times but that's been more for forward structure than the fact that he wasn't going that well. "For 200cm, he actually moves quite well, he can get off his opponent and when he plays well, his marking is his feature." 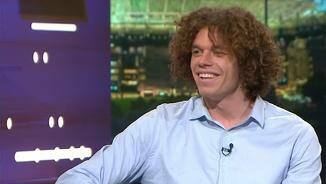 “He still hasn’t done a pre-season, so in terms of what he’s been able to achieve, it’s been excellent. “He complemented the other members of the forward line well. By his own admission, he wasn’t overly happy with his finals campaign. 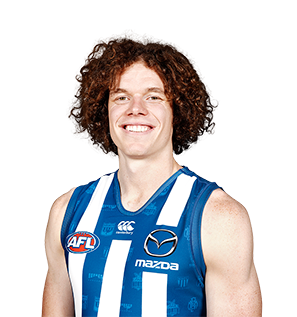 Selected with North Melbourne’s final pick of the 2013 National Draft, Ben Brown didn’t have the smoothest start to AFL football. An assortment of injuries forced the Tasmanian to have an interrupted pre-season and delayed his return to the field. Once the 200 centimetre big man returned to action through Werribee and the VFL, the assumption was that he would require a handful of games simply to get back into the flow. Instead the improvement was swift. Brown was selected to make his debut in Round 14 against Melbourne and immediately helped to make the forward line function better. Although a finger injury cost him two matches, on either side of it North was able to kick higher scores; three goals a game more when he was in the side. It was in the Elimination Final where Brown played arguably his best game of the year. With four goals in the second half, he forced all sorts of defensive changes from the oppostion as North charged from 33 points down. He finished with 18 goals from his 11 games, an impressive effort considering he was playing through knee discomfort. Brown will resume training after Christmas.